As the year comes to a close, we always get the reflexive compulsion to look back and take stock of what happened and consider what’s to come. And this year truly brought a sea change on a number of fronts in digital publishing. Facebook and other tech giants stumbled mightily from one PR disaster to the next, culminating in top executives literally telling Congress that they expect to be regulated. Who would have imagined that? And the old, sad chase for eyeballs might finally be laid to rest, as digital pubs pivoted away from video, away from chasing mass audiences via social media, and toward reader revenues and putting the audience first. And while the digital ad duopoly of Facebook and Google face headwinds of regulation and a public backlash, Amazon is expected to make it a “triopoly” as their ad growth is skyrocketing. It’s a lot easier to talk about what’s wrong at Facebook than what’s going right, and that goes doubly for its relationship with publishers. At the beginning of the year, Facebook changed its News Feed algorithm to downplay news pages and then saw its own usage flatten over the year. Things got worse when Facebook forced publishers to go through a verification process just to boost posts with political stories. Even at South by Southwest, a techie’s fevered dream, the “techlash” was in full effect with entire panels devoted to attacking Facebook. Even worse for the technology behemoths was the continued pushback from regulators in the EU and U.S., including a rare bipartisan rebuke against executives. While Republicans and Trump have alleged anti-conservative bias at Facebook and Google, many others believe they need stronger regulation around privacy, especially after so many scandals related to politics (see Cambridge Analytica) and data leaks (see Facebook’s not-so-private photos). Expect more backlash and more regulation to come. And if you’ve grown tired of the exploits of the digital ad duopoly, rest assured you have a new tech giant to worry about: Amazon. The Seattle behemoth has quietly slid into third place among digital ad purveyors and is set to grow a whopping 400%+ per year to grab 15% of U.S. market share by 2020, according to eMarketer. And the signs have been growing about Amazon’s dominance all year, from the time they beefed up agency and marketer support to the point where they had a scandal over sponsored wedding registry listings. Let’s celebrate another player to give Facebook and Google a run for their money – as long as they play fair. He tried so hard to penalize CNN. But in the end President Trump failed to block the AT&T purchase of Time Warner, or force a spin-off of CNN (which has been on a money-making tear). Instead, the mega-merger was approved by the courts, and we also saw Fox offload most of its assets, including the 21st Century Fox studio, to Disney, while Comcast skulked away in defeat. And T-Mobile and Sprint passed their final hurdles to merge in 2019, leading to only three major mobile services in the U.S. They promise to cut prices for consumers, but less competition usually results in higher prices overall. How will all these huge mergers play out in 2019? For the media companies, it’s all about taking on the disruptive tech giants moving into entertainment and streaming. For the wireless carriers, it’s about moving toward speedier 5G to give us faster streaming (at higher prices). All those trends will come together as Disney unleashes its new streaming service next year. This year just reinforced growing trends in 2017, that will likely continue into 2019: Digital-only publishers cannot rely heavily on advertising or even sponsored content. Without diversified revenue streams, and especially reader revenues (subscriptions, memberships, etc. ), most of these former darlings will end up hallowed out, like what happened to Mashable before and Mic recently. Even BuzzFeed had to move toward an NPR model, asking for $5-a-month memberships to support its news operation – complete with the cliché tote bag reward. As Facebook took a tumble this year, others stepped into the void and took advantage of the social giant’s missteps. The most ironic beneficiary was Snapchat, which had taken a beating from Facebook with copied features (ahem: Stories). The company stepped up its game by letting marketers target publishers in Discover and letting publishers use non-exclusive content in Discover. Even old stalwarts like Flipboard and Pinterest saw their stock rise as Facebook fell to earth. Why? As Facebook dealt with misinformation and algorithm angst, Flipboard focused on human curation and Pinterest on lifestyle. Of course, Facebook does own Instagram and WhatsApp, which continue to grow and thrive outside of the parent company’s shadow. As noted above under the “Digital Media Reckoning,” the move toward reader revenues means more ad-free environments, and streaming giants like Netflix and HBO are leading the way. Even Facebook did some research on whether a subscriber-supported ad-free social network would pay off. Meanwhile, cable nets such as AMC Network saw their advertising revenues drop, while distribution revenues soared as they sold content to streaming networks and diversified. Where does that leave our old friends, the purveyors of linear TV? They’ve had to up their game and innovate with “addressable TV ads” that target people better than mass market TV ads, which are on the wane. And AT&T’s purchase of Time Warner has given the telecom giant a chance to broaden its offerings with more content and data. Linear TV will continue to find ways to battle – and emulate – the streaming upstarts. Podcasts continue to mature and large publishers such as New York Times and Washington Post are pushing deeper into the audio-on-demand medium. There were some hiccups in 2018, with Panoply dropping its podcasts to focus on being a platform and infrastructure for podcasts. And BuzzFeed also closed its in-house podcast production outfit to focus on long-form video. But there were also signs of continued expansion, as Malcolm Gladwell and Slate’s Jacob Weisberg launched a new podcast company called Pushkin Industries, and iHeartRadio bought podcast producer Stuff Media (which makes “How Stuff Works” and more). The reality is that as metrics improve, including the NPR-led open source RAD technology, more marketers will jump in and find that podcast listeners can be a very loyal bunch. With the tech platforms hitting rough spots, this has been a year of retrenchment for publishers, who are taking stock of what’s really working and what’s leading them astray. The days of shiny new objects like VR and blockchain seem to be on the wane, and a laser focus on the user and serving the public are front and center. As VC funding becomes scarce, media startups need to be more practical and strategic. The chase for eyeballs is coming to a close, and now we can think about what’s real for our businesses – and for our communities. Are you down with OTT? Yeah, you know me. O is for ‘Over’. 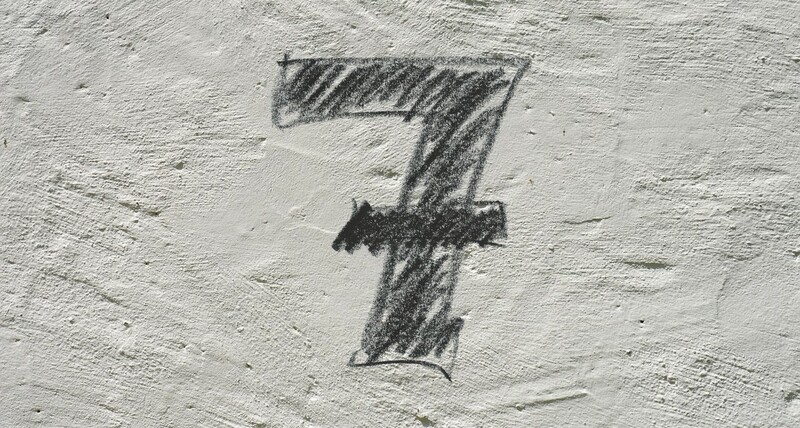 T is for ‘the’. The last T? Well, it’s not that simple. What exactly is the ‘Top’? You probably haven’t heard two people define OTT alike. In fact, lately it has come to mean everything Other Than Traditional. (a) STB: the set top box with your cable subscription and remote control using a private cable network also known as an MVPD (multichannel video programming distributor). These days, consumers can also stream their favorite content like Netflix via apps integrated with their STB. A lot of streaming content can also be accessed via Xbox and PlayStation gaming consoles that increasingly take centerstage in living rooms. (b) STV: the smart TV. No longer just a screen, these televisions are equipped with an operating system (e.g. Android TV) so that they can connect to the public Internet network and directly stream content. Moreover, CTV (connected TV) streaming devices like Fire TV, Apple TV, Chromecast, and Roku, connect TVs to the Internet to stream consumers’ favorite content onto any TV no matter its IQ. (c) iOS, Apple mobile Apps, and Android Apps on Google Play. These apps allow consumers to stream content on mobile phones anytime, anywhere. Users can also directly “cast” or project from a smartphone to televisions, which allows the mobile to serve as the new universal remote. And let’s not forget how many people stream video over the Internet onto laptop, desktops, and tablet. (d) All of the above. Or, DTC- Direct to Consumer. This is the right choice and what it’s all about. Essentially, it’s all about the direct distribution of video content to consumers over the Internet, no matter how its accessed whether by streaming device, gaming console, Smart TV, mobile device, computer or STB. No cable company/private network required. Often, there is confusion about PTV (Programmatic TV) — which is the enablement of digital data capabilities for greater audience insights than GRP (Gross Rating Points) and reports in real-time instead of months. There’s also its subset ATV (Addressable TV), which accomplishes one-to-one digital targeting capability. PTV and ATV improve the targeting and reporting capabilities of both OTT and traditional linear TV. 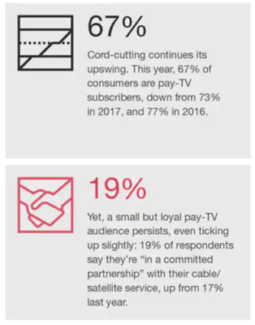 For broadcasters and video creators, OTT offers a direct relationship (and possibly content subscriptions) with consumers outside of the cable TV universe. But like OTT itself, the Internet-delivered video market is acronym-riddled and complex. A good grasp of the basics will help you understand the many opportunities ahead when viewership of various OTT video services will overtake traditional broadcast TV. This is predicted to happen within the next 5 years, according to a recent OTT Video Services Study. In addition, revenues in the Global OTT market will increase to $18 billion in 2019, more than doubling the market from just three years ago. This has massive implications not only for those who produce content, but for agencies, advertisers, and technology providers as well. As companies in this space begin to assess how they will address this massive paradigm shift, it’s a good time to get familiar with the OTT opportunity. Streaming video on demand—also known as OTT viewing –is becoming the norm in video content consumption today. It also presents an incredible opportunity. The combined size of the OTT market was estimated at $29.4 billion in 2015, and is expected to grow to more than $64 billion by 2021. 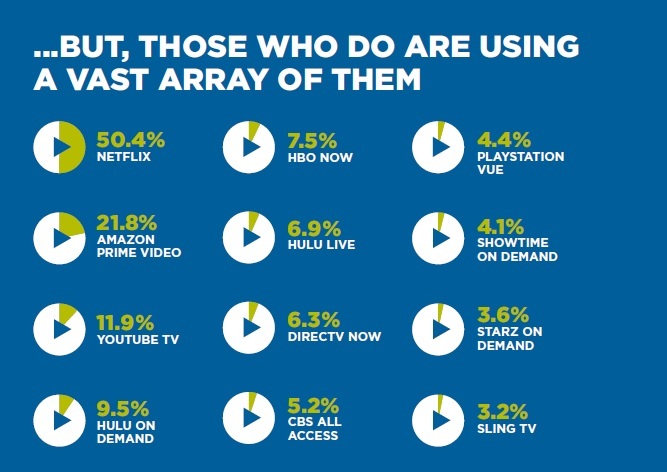 Parks Associates reports that one-third of US homes have a streaming player, which is one of the most popular ways to view video today (other than traditional TV). Though mobile already accounts for more than half of all video viewing. In its report, Top 5 Video Trends in an IP-based World, Parks Associates examines both the challenges and opportunities presented by the rise of OTT video viewing. 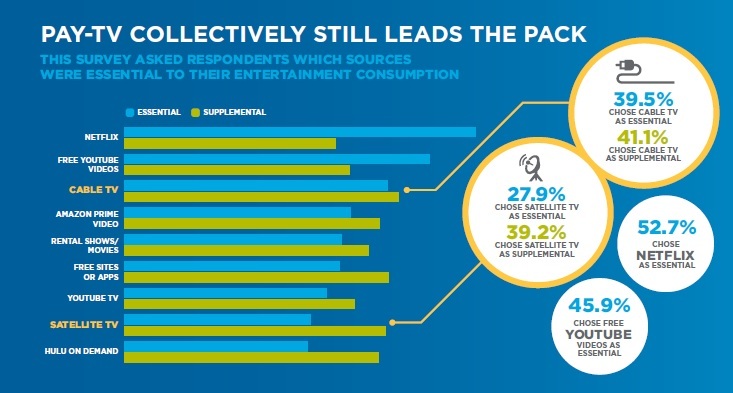 In addition to outlining these trends, the report looks at larger market challenges such as allowing content distributors to own the consumer relationships and the evolution of storytelling, content production and delivery in an IP-based world. Users expect opportunities to interact with their content. This presents challenges in terms of flexibility and responsiveness, but provides an opportunity to learn more about—and appropriately monetize—audiences. Global, IP-based video services will be the next big revenue pool for content makers. This presents challenges to reaching a global market for everything from technology to legal and localization issues. However, the opportunity for monetization at scale and in hyper-local and niche contexts is huge. Live TV is not dying; it is shifting to connected devices. The technological demands of delivering live content at scale are quite high but audiences are attracted to real-time content, which creates a must-watch revenue opportunity. 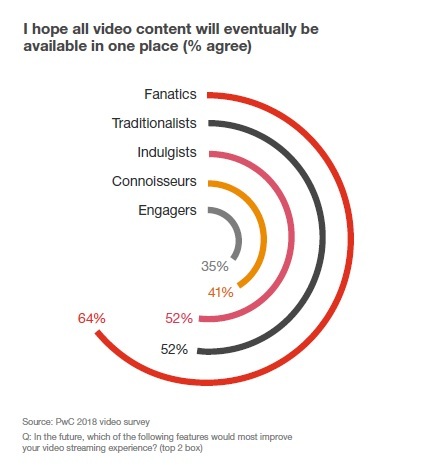 Consumers will demand new, diverse types of content. Creating new content types is never easy, but for those who do, audiences and earnings are sure to follow. Artificial Intelligence (AI) will play a key role in the success of video services. Though already being effectively implemented in a range of media settings, AI is hardly a perfected technology. There’s plenty of work to be done. That said, Parks sees it as the key to the evolution of personalization, with monetization opportunities to match.